Hello there! Welcome to my official website! I cannot tell you how inspired and excited I am to be going on this enchanting journey with you. The last couple months of my life have been a series of moments of beautiful chaos. I have really gotten to know myself. I have taken the time to do inner work. I can feel the shift happening in my life. I can feel I am transforming. But this didn’t happen instantly. How do I change my life? When will I be happy? When will things start heading in the right direction? I can’t recall the exact moment, but something clicked inside me. I realized that whatever the experience – personal, professional, or romantic – I wasn’t happy even if I changed the person or job. Things still remained the same. My heart whispered to me: Gosh, maybe it had to do with me. Maybe I was searching in the wrong place all this time. So, earlier this year, I made the life-changing decision to work on myself. To go on an inner journey. I was going to head on face my fears, doubts, and limiting beliefs. And after I faced them, I was going to kick them out of my life. 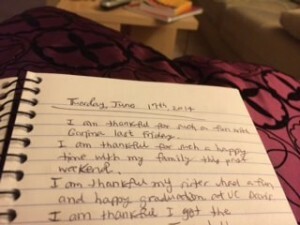 I did many things to clear out my inner crap and replace it with my inner beauty and goodness, but one practice I did consistently was gratitude journaling. Gratitude journaling is the simple act of writing down things for which one is grateful. When I started, I had no idea that I would come to love it. I let my energy and feelings flow naturally like the river. I didn’t force myself to feel grateful or motivated. I waited until I felt serene and connected to my inner self. There is no perfect time to journal, but during the night is the best time for me. I slipped into bed, played some soft music, and closed my eyes. I thought about my day. Once I was relaxed, I jotted down the things I’m grateful for. The more I gratitude journaled, the more my lists became longer and I felt happier. It’s not that my days had drastically changed. I was more aware about people and things in my life that I truly appreciated. I now made the conscious decision to be happy and grateful. I strove to be as honest and personal as possible. I didn’t leave anything out, even something that seemed so simple. I jotted down things like: I feel thankful for him holding my hand. Or I am thankful for my mother cooking my favorite dish. 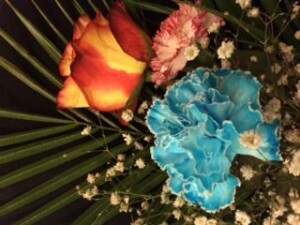 Even something like: I feel thankful to have gone through my weekly meeting at work smoothly. After I realized how these simple acts made me happy, I made an effort to do the same for my loved ones and friends. I paid close attention to any unexpected moments or events that occurred. However big or small, I recorded them in my gratitude journal. Uncertainty and unexpectedness is a part of life. Being a Taurean, I like to be in control and am a bit resistant to change. But now, instead of resisting change, I go with the flow and allow life to surprise me. Life has its own mysterious and surprising workings. I’ve learned to become thankful for these unexpected moments even when I cannot understand them at the time. I take a deep breath and let life move me. The more I’m grateful, the more open and receiving I am of life’s beauty and miracles. I would love to hear about your thoughts on this post. Are you in the middle of a transformation? What are some of the things you are grateful for in your life now? Please share with me in the comments below.